People have been trying to preserve milk products for hundreds and hundreds of years. Cheese was a revolutionary and unexpected discovery – it turned out that the fermentation process could be controlled. As Clifton Fadiman once said: “A cheese may disappoint. It may be dull, it may be naive, it may be oversophisticated. Yet it remains cheese, milk’s leap toward immortality.” We shall start our tale of cheese with milk. 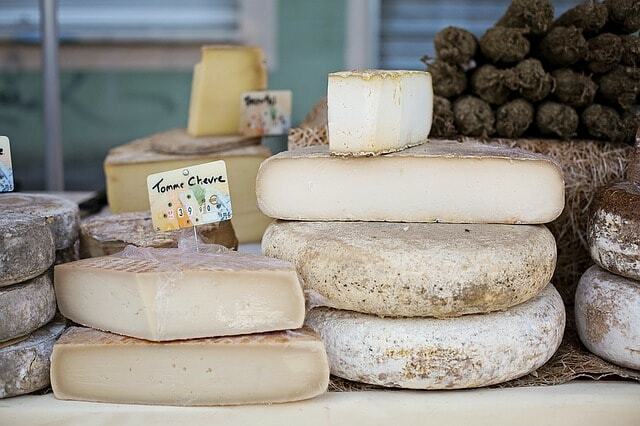 Classification of cheese is not quite straight forward, so let’s start with the basics. First of all, experts divide cheeses into “industrial” (produced by large companies, on a large scale) and “artisan”, which is produced by farmers in small batches, and often it is completely handmade. For production of industrial cheese, only pasteurised milk is used. First, the milk is heated up to 57–68 °С (it allows to eliminate harmful bacteria and to prolong shelf life of cheese), and then it is cooled down to 6–7 °С. Even though the heating process destroys the bacteria, it also destroys the milk structure and its original taste qualities. Artisan cheese producers, who are especially famous in France and Italy, always follow traditional methods of production, typical to the respective region. They use varieties of cow, sheep and goat milk. The milk is neither pasteurised nor homogenised – it is used “raw” and unprocessed. The basic principles of cheese making haven’t changed since the times of The Odyssey, where it was described by Homer. A special bacteria or rennet are added to the milk, it turns a part of lactose into lactic acid, and milk starts to curdle. For most of the cheeses coagulation happens at 30–35 °С. Some cheeses, especially made from goat cheese, could be made at 20–25 °С, and some would need the temperature to go up to 40 °С. One of the most famous cheese dishes is Fondue – a simple dish, prepared and eaten in the same pot. Originally, cheap wine (sometimes even slightly sour) was added to a pot and heated, and then hard cheese, which was already dry and quite old, was melted in the wine. People would enjoy their melted cheese by dipping pieces of old bread in it. It was a great solution to consume food which would otherwise go waste. The production of soft cheeses like Italian ricotta, French brie or camembert doesn’t need complicated heating and cooling procedures. Once the curdling process is complete, they can be either be served immediately (like ricotta) or put in suitable shapes and left for ripening. Hard varieties of cheese, like Swiss or Dutch cheeses, require curd to be heated and cooked. Thus, during the production of hard long-lasting cheeses like Parmigiana and Grana Padano, the curd is “cooked” for at least 40 minutes at about 55 °С, and only then it is transferred to the moulds. Whey, a by-product of cheese-making (of hard cheeses), is also used for making very rare cheese varieties. It contains a large amount of protein that only curdles at high temperatures. For example fresh Roman ricotta is made from whey left after making of Pecorino. The whey is heated up to 70–75 °С, then curdled with citric acid and heated up to 85–90 °С at the end again. Separated milk solids are distributed in small baskets and left for at least 12-14 hours to drain remaining liquid from the solids. At the end of the process ricotta is ready for serving! Besides Roma, famous whey cheeses are produced in Norway and France (Corsican brocciu). The types of cheese and ways of their production do not end here. A special category of cheeses is called “stretched-curd” or “pulled-curd”, which is especially popular in the South of Italy, where they are called “pasta filata”. The most famous types are Mozarella and Provolone. For the production of these cheeses, milk solids are mixed with skim milk and then cooked at high temperatures, at the same time the kneading process starts, until the mixture becomes elastic “dough”. The origins of this method date centuries back, when people had difficulties with transporting fresh milk. Because of hot climate, milk became acidified by the time it reached cheese makers, and curd started to separate. If you keep this curd in a warm place for a few hours, or even better if you put it in hot water or whey, it becomes elastic. If you keep kneading this mass, then it becomes stable and obtains a “string” structure. Depending on the type of cheese, granular curd can either be made very small and dry (like for Provolone), or large and wet, like for Buffalo Mozarella. this technique is supposingly originated from ancient Greece, from where it came to the South of Italy. Now, let’s look at the last stage of cheese making process – ripening. Except for fresh cheeses which can be consumed immediately (like ricotta), all other require ripening process, which results in the unique taste and aroma qualities. Almost all cheese which produced with rennet is stored for the ripening and aging in special cheese cellars. From the moment of ripening process, cheese becomes a responsibility of “affineur”, who is practically a “raiser” of the cheese, taking care of it during the ripening and aging process. Affineurs still follow traditional methods of their regions, which have been passed down from generation to generation. Most of hard cheeses require relatively high temperatures, for example, French cheese Comte requires high temperatures (19 °С) and humidity (92%). On the other hand most of goat cheeses ripen at 10 °С in the cellars with good air circulation and humidity of 80%, that is considered rather “dry”. Normally, as the aging process continues, the temperature in the cellar should be slightly lowered. Of course, it is much easier to do in artificial conditions and industrial buildings, rather than in traditional cellars and caves. Moreover, ripening and aging process of most cheeses made for raw milk doesn’t end in the cellar – it continues during transportation, storage in the shops, and even in our own fridges. Thus, Parmigiano Reggiano is kept in salted water for 20-25 days, then it is dried in the sun and afterwards kept in the cheese cellar with good air circulation and high humidity, and stored at 16–18 °С. From time to time it is tubbed with olive oil to avoid mold formation. Aging process lasts for at least 12 months, but to receive a famous tag of Parmigiano Reggiano it needs to stay in the cellar for at least 24 months (the date of manufacturing will always be written on the cheese). The “blue” cheese Roquefort is kept for 4-9 months on oak shelfs, in the caves with good air circulation, which are located in the Combalou mountain, next to the village Roquefort in France. A real underground maze has 11 levels and has barely changed since the XVII century. The caves are cold (9 °С ) and humid (95%), and a perfect natural ventilation is ensured by a complex system of stone cracks. In winter, in cold weather, warm air leaves the cave through the cracks (the more cheese is stored in the cave, the warmer the air is). In summer, it works other way around: hot air cools down on the Northern cliff, absorbs humidity and enters the caves. The process of mold formation happens naturally, because of the tiny cheese particles set on the walls of the cave, that create a perfect environment for the mold (Pénicillium roquefort). The ideal temperature for cheese storage is 10 °С and it should be well covered, for example, wrapped in parchment paper. Fresh cuts of soft cheese should always stay covered. Soft cheese prefers warmer temperatures – it is aways best to let camembert or chevre sit outside of the fridge for at lest 40 minutes before serving, only then the full taste comes out. French emmental cheese is kept in a cellar for 4-5 days at 13 °C, and then at 16–18 °С. After one week it is moved to a different cellar, where it is kept for another month at 21–25 °C, then it is moved back to the cellar at 16–18 °С, and at the end of the process it stays at 10–13°C. French Cammembert is moved to a “dry room” on the third day of the ripening process, where it is stored for about 12 days at 10 °С, and then the final ripening takes place. Camembert which was ripened for 21-22 days only is considered to be very young, and it reaches its best on the 30th-35th day of the ripening process. Artisan cheese making process is an art and science, with centuries of knowledge, passed down from generation to generation. Because of the need of special environment and simply plenty of family-kept secrets of manufacturing process, replicating them home is almost impossible. In this article, we hardly touched general stages of cheese making, and you can see how complex it might be. If you travel in the cheese regions – don’t miss your chance to try raw milk cheeses straight from small producers, and you will feel the rich history and tradition stored in this unique product! This guest post was contributed by Natur Produkt (“Натур Продукт”), the first Russian media project a natural, environmentally friendly life style. It shares knowledge about how to make our lives and surroundings better. The original text of the article (in Russian) can be seen here. It’s very educational and interesting post. Thanks for sharing. This is so interesting, my husband and I are huge fans of cheese! Artisan cheese tastes so different and so much better than industrial cheese. Interesting and educational. Artisan cheese making process is indeed an art and science. Thank you for sharing. What a great post , I had no idea that’s how Parmesan was made and didn’t know that cheese shouldn’t be stored in the fridge ! very educational! I love cheese so definitely a new found appreciation for the cheese makers. This is an interesting explanation of the entire cheese process. I never knew all of what it took to age and ripen cheese. And I love cheese. Thanks for the good info. What a great post, very insightful!